The mediafront platform is an open source (GPLv3) front end media solution for the web. Through its integration with popular content management systems, it employs an innovative and intuitive interface that allows any website administrator to completely customize the front end media experience for their users without writing any code. In addition to this amazing module included is the OSM (Open Standard Media Player) Player. 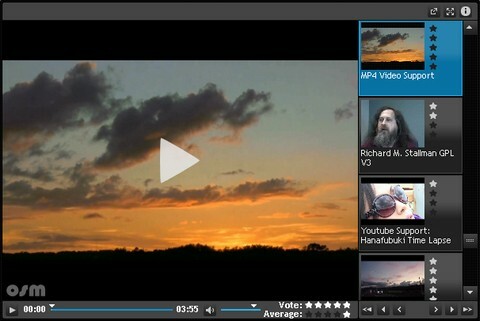 This media player is open source (GPL) media player that is built to dynamically deliver any type of web media, including HTML5, YouTube, Vimeo, and Flash. Thank you for consistently sharing the most amazing web development resources. OSM Player is another example of one of those hidden gems. Keep up the great work! You can learn more about HTML5 Video on the new site Kaltura recently launched with Mozilla and the Open Video Alliance – http://www.html5video.org. There you can also check out Kaltura’s HTML5 Media Library – in beta with Wikipedia.